Police have released some vey blurry surveillance photos of two people they’d like to speak to in connection with the attack against Empire actor Jussie Smollett. According to the Chicago Sun-Times, police are not referring to the figures in the photos as “suspects,” but “persons of interest.” At this point, they’re trying to locate the pair to see if they were involved in or witnessed the brutal attack against Smollet that happened in Chicago’s Streeterville neighborhood early Tuesday. Smollet told police his attackers approached him “by yelling out racial and homophobic slurs towards him,” then hit him in the face, poured bleach on him and put a rope around his neck. The incident is being investigated as a hate crime. Smollett told police that the attackers were white, wearing ski masks and dressed in all black clothing. In a second statement, he added that they yelled “this is MAGA country” following the assault. 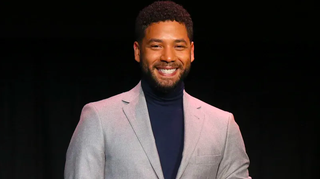 Smollett’s manager, Brandon Moore, told Variety that he was on the phone with Smollett at the time, and said he heard the slurs. “I heard that clearly. I heard the scuffle and I heard the racial slur,” he said.